Beautiful printed certificate from the City of New York issued in 1858. 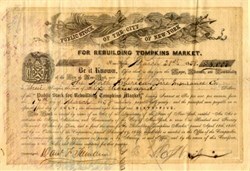 This historic document was Public Stock Public Stock of the City of New York for rebuilding Tompkins Market. It has an ornate border around it with a vignette of the New York State Seal. This was issued to the North American Fire Insurance Company for $6,000. This certificate was handsigned by New York City Mayor, Daniel F. Tiemann and is over 147 years old. This is the first time we have had this for sale.